If Sheriff Clarke owns the libs and Fox News isn't around to hear him, does he make a sound? Bay View isn’t hurting for quality restaurants. Adding to the culinary acumen the neighborhood boasts is a wide-ranging cast of newcomers who are bringing a welcomed dash of variety to the bounty Bay View already offers. This partial year alone has brought Kinnickinnic Avenue a new fried chicken restaurant, its first dedicated burger joint since Hamburger Mary’s left, a microhotel with an upscale ground floor bar and bistro, and the first of three planned sushi places. On September 1, Sushi Go became the first of that sushi trinity to open, but its enlarged take on food truck sushi admittedly left something to be desired. 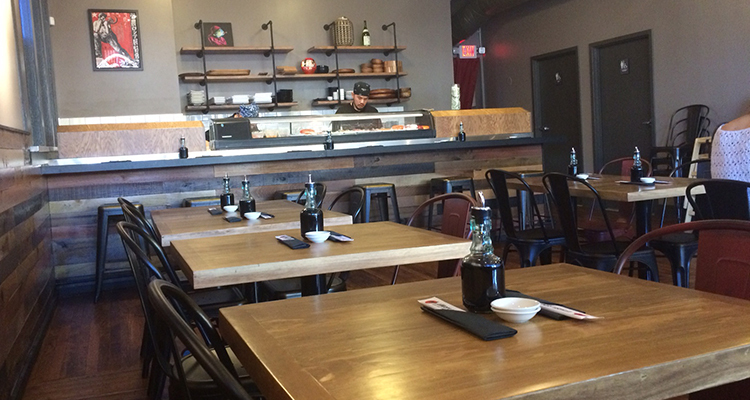 Less than two weeks later, Hungry Sumo Sushi Bar (2663 S. Kinnickinnic Ave., 414-595-9656) quietly opened its doors about a mile down the road and, in doing so, introduced Bay View to a more traditional take—at least more so than a “Sushi Burrito”— on sushi and contemporary Asian fare. With nearby Sushi Yuki seemingly nowhere close to opening (at this point, we’d be shocked if it even happens), Hungry Sumo appears to be tasked with making good on the newfound promise of genuine sushi finally being available in Bay View. A few weeks after its abrupt opening, Milwaukee Record went to see whether Hungry Sumo would deliver on that promise. The space: Hungry Sumo took over the storefront at the corner of KK and Lenox Street that Cream City Swirl most recently called home. Since moving in last December, the new tenants have invested considerable amounts of time and money to transform the limited dining space as much as possible. The gray interior paint job is the only real remnant of the yogurt shop’s presence. Beyond that, all Cream City’s counter space on the south wall has been removed, with the sushi station moving to the restaurant’s western end. This opens up the dining floor enough to accommodate three rows of wooden two- and four-top tables. In all, there’s roughly 12 tables and an occupancy that tops out around 50. Decoration is minimal at this point, but select prints and lanterns do their best to liven up the sleek-but-sparse interior. The restaurant’s so-called “fusion” element is possibly provided by the less-than-subtle club music accompaniment. Perhaps us visiting in the early evening was partially to blame, but it was a little strange to hear DJ Snake’s “A Different Way” and “Tuesday” by Burak Yeter bumping as we enjoyed our meal. Milwaukee Record‘s food: We did, in fact, enjoy our meal. It started out with a bottle of Kiran Ichiban, one of Hungry Sumo’s three beers. Like Sushi Go, wine and sake are also available. Our beer came to us with a complimentary cup of white miso soup that had diced tofu pieces and shallots swimming in the hot broth. Per our server’s recommendation, we started our meal off with an order of Creamy Crab Wontons ($6.95), which she likened to crab rangoon. Her comparison turned out to be accurate, as the order was six pieces (a happy accident, since the menu noted the order came with five pieces) of thoroughly crispy fried wonton stuffed with imitation crab and cream cheese. It was far cry from fancy and a tad small for costing more than a buck a pop, but the Creamy “Crab” Wontons were still a refreshing change from the greasy, soft-shelled rangoon we were accustomed to eating. With a grasp on some hot offerings (yet bypassing teriyaki bowls and entrees like pad Thai, pad kee mao, and three types of curry in the process), we decided to cool things down by seeing if the sushi bar could come through with its signature menu item. 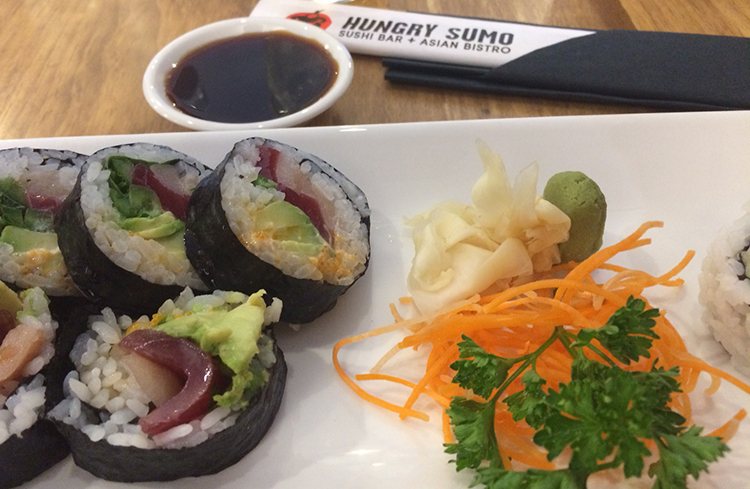 Though its selection is both vast and versatile, more than half of Hungry Sumo’s menu is populated with some type of sushi. There’s donburi (raw fish over rice), sashimi, maki (classic maki, cutely-named and specialty “contemporary” rolls, and veggie maki), and six sushi bar combos. 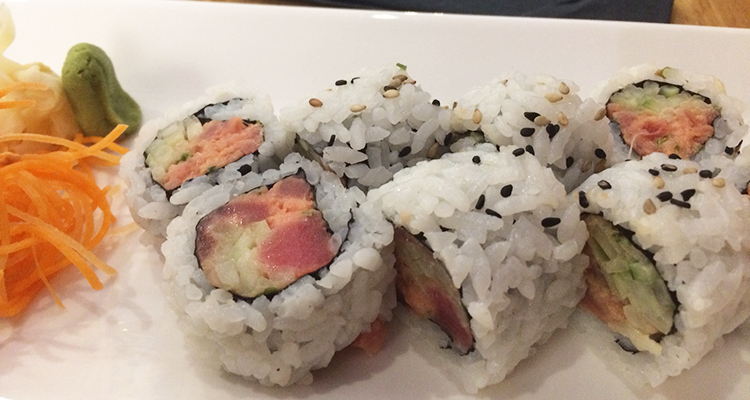 Somewhat intimidated with the volume of options at hand and anticipating this would not be our only trip to the young establishment, we picked one old reliable in the spicy tuna roll ($6.95) and went slightly more nuanced with a “Summer” roll ($9). The former (pictured at the top) was exactly what seasoned sushi eaters would expect: sesame seed-flecked sticky rice wrapped around nori, which itself was wrapped around fresh chunks of raw tuna, crunchy cucumber strips, and a hint of spicy mayo. The eight-piece roll didn’t exactly deliver on its promise of spice, but it left more space for the fish to take hold of the altogether satisfying $7 roll. The Summer roll (above) came in six pieces, but was larger than the previous order, and more densely packed with tender hunks of tuna and whitefish. The inclusion of diced jalapeno and chili oil helped somewhat justify the thermometer pictured beside Summer on the menu, and the fresh cilantro, avocado, and lime juice added a little depth to help balance out the spice. 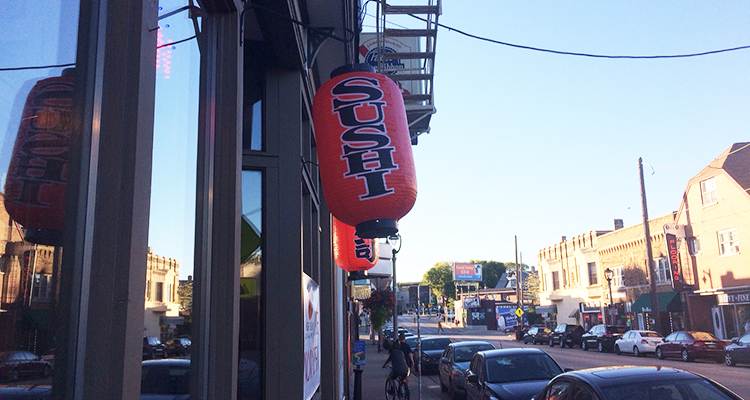 The verdict: From zero restaurants to two in a matter of days, Bay View’s point of sudden sushi saturation is nigh. But early returns seem to suggest Hungry Sumo is the better of the two new establishments, and an operation that could have some staying power as a casual date stop, a place to scratch an itch for sushi or curry dishes, and as a positive culinary continuation of a neighborhood that has quickly established itself as a Milwaukee dining powerhouse.